Description Absolutely beautifuly property in a wonderful location. 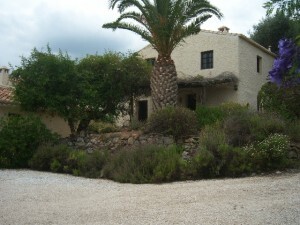 This converted Olive Mill has been renovated to the highest of standards and is divided into 2 impressive properties. The Mill House provides spacious and very comfortable accomodation and the adjacent Farmhouse is ideal for guests or as a very successful rental unit. The houses are located in the centre of their own plot of 4000 sq mtrs and are accessed via a very well maintained track leading to double entrance gates and a very attractive private driveway. It is 10 minutes from each of 2 lovely villages and 45 minutes from Malaga Airport. This is a unique property with the most beautiful formal gardens, a large 10mtr x 5mtr swimming pool and panoramic views. The Mill House comprises a fitted and equipped kitchen leading to an open plan dining area, an inner hallway with restored olive press then leads into the main sitting room with a feature fully restored millstone area. The inner hallway provides access to the renovated hayloft which can be used as an office/study or as bedroom 6. On the ground floor there is a guest toilet and cloakroom. Stairs lead to the master bedroom suite with double aspect views and ensuite shower room. There is a 2nd spacious bedroom with ensuite shower room and access onto a covered terrace area. The property has mains services, full oil fired central heating, broadband internet and satelite TV. There are ceiling fans and adequate storage areas, cupboards and wardrobes. To the rear of the Millhouse there is an enclosed terrace area, fully plumbed workshop and utility room - this area would ideally convert into further bedroom and bathroom accomodation if required. There is an enclosed courtyard garden with fruit trees and access to the Farmhouse. There is a roof terrace with amazing views to the distant mountains. To the front of the Mill House is an impressive covered terrace with an outdoor kitchen and views to die for. There are beautiful formal gardens with mature trees, shrubs and flowers and a fantastic pool terrace with large pool and panoramic views. To the side of the Mill House is the adjoining farmhouse currently providing considerable rental income. The Farmhouse comprises entrance into a large dining hallway, fully fitted kitchen/breakfast room and a spacious renovated original sitting room. There is a bathroom at this level and stairs lead up to 3 double bedrooms. This is a truly impressive and special property and it has further potential for expansion if required. PLEASE NOTE THAT NEW PICTURES WILL BE FEATURED ON THE WEBSITE VERY SHORTLY.